LOPO produces rectangular or curved terracotta louvers of various cross sections, including oval, rectangular, square, circle, and triangle. Terracotta louver and baguette are versatile and visually expressive. They are sunshading and design aesthetic when used in the front of windows, balconies, glass curtain walls, and can act as design elements when used in special areas such as corners, parapets, outdoor ventilation facilities and parking building. In architectural projects, terracotta louvers and baguettes are used together with terracotta panels to show an integral facade. Wide range of colors are available on request. Special shapes or profiles are available on request. The most commonly used shape is square, rectangular, triangular or oval cross-section. LOPO’s basic installation system for terracotta baguettes and louvers includes side fixing and back fixing solution. Baguettes and louvers can be installed horizontally, vertically or at any specific angle. We offer miter-cutting service for corners. Check brief introduction of LOPO Terracotta Baguette Installation System. More terracotta baguettes and louvers details for mounting system are available on request. LOPO terracotta baguettes which have square profiles are usually applied as sunshade devices and aesthetic elements for building facade. Maximum length:1,800 mm. Special finishes like metallic, sandblasted surface and 4-faced glaze is available. 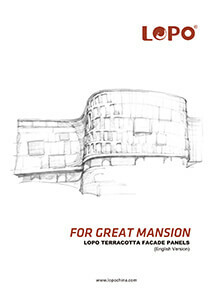 LOPO terracotta louver has wide options of standard and custom profiles, glazes, colors, shapes, finishes and dimensions that can create unique terracotta charms for any project. Miter cuts and drilling options are available on request. LOPO Terracotta Baguettes have obtained CE certification and demonstrated excellent physical properties and excel in dimensional control accuracy, surface flatness, color consistency, durability, breaking strength and water absorption. 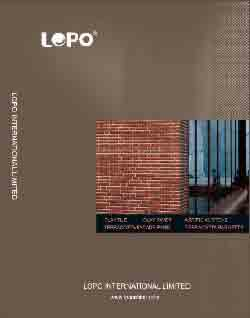 Click here for Technical Specification of LOPO Terracotta Baguettes.